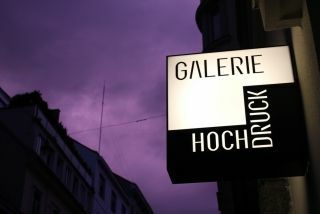 Galerie Hochdruck features European and International original prints, including Japanese prints. We also offer a great number of collectibles related to printmaking, such as artists' portfolios, artists' and illustrated books, catalogues, booklets, art journals with original prints, artists' posters and secondary literature about printmaking. The gallery has a special focus on the relief printing techniques woodcut, wood engraving, linocut and relief etching but also boasts rarely seen examples of relief printing like metalcut, papercut and wallcut. Modern art movements represented are Vienna Secession, Art Nouveau, Japonism, Expressionism, Surrealism and Abstract Art. Fine prints of both young and renowned contemporary artists are regularly shown in special exhibitions. The German word "Hochdruck" means both "relief print" and also "high pressure". The word also describes the way in which someone does something with a lot of enthusiasm. Thus, Galerie Hochdruck would like to present its complete inventory both to aficionados of printmaking and to collectors who are interested in acquiring prints. You are most welcome to inquire about all objects listed here or on our website. We also offer a search service for prints you are looking for but we don't have currently in stock.